Considering I’m pregnant, I’m surprised I have not had any crazy food cravings. Don’t they say that you normally want unusual snacks like pickles with ice cream? I guess I’m pretty fortunate that I haven’t been craving pickles; my body has actually been perfectly fine with eating healthy food. This salad is one recipe I keep making over and over again. I’m confident that this will be one of your new favorite salad dressings! This is a savory, robust, slightly spicy, and flavorful salad. I like to take this salad to parties (it’s always a hit!) or I pack it for an easy lunch. When I eat it as a full meal, I pour the dressing over about 1 & 1/2 heads of romaine lettuce with a couple Roma tomatoes, and eat it all to myself! As we all know, conventional caesar salads are not vegan and they are not healthy either. That being said, I am so happy that caesar salads can be a part of my life again. My friends at Panevino restaurant (a local and fabulous Italian restaurant here in Vegas) have an incredible, plant based, caesar salad on their menu. This recipe is my version of their salad. Caesar salad used to be one of my favorite things on the planet to eat. Not only were they amazingly delicious, but I also thought I was being rather healthy ordering a hefty caesar salad before dinner. I first learned that caesar salads had fish in them, and as a young child that freaked me out. Then as an young adult I learned that caesar salads are one of the most unhealthy salads that one can order at a restaurant (dang it! I thought I was being healthily)! Stocked full of sodium and fat, a conventional caesar salad is heart attack over lettuce. Let’s create a new healthy habit! Whisk together ingredients and store in refrigeratory overnight for best flavor. (Can also be served immediately). Leave a comment and let me know your favorite salad dressings! Any alternatives to the yeast and almond meal. I have yeast and nut allergies and it has been so hard finding foods that I can eat since I found out I’m allergic to everything under the sun. Suggestions? Hi Dennise! For this recipe, I am not sure of a similar replacement. The taste of nutritional yeast is a difficult one to replace. I will ask around about this though. In other recipes, you generally can use seeds instead of nuts; I love to use sunflower, chia, flax, hemp seeds, etc. 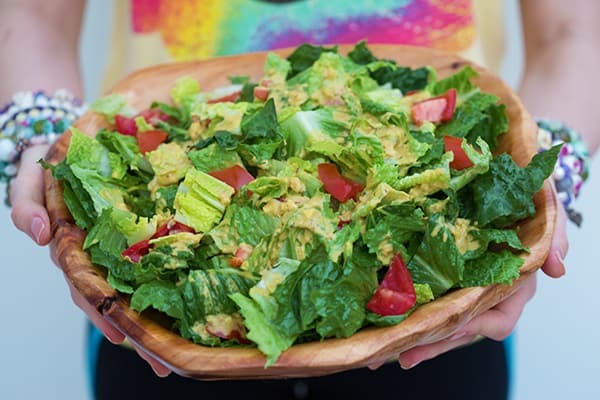 The nutritional yeast in this recipe is used for flavor, of course, but also for slight thickening…ground flaxseed would have the same thickening affect, but not the same taste. As far as the almond meal, that could be left out. It’s more for texture than taste.